Guard Blocks and shoots back enemy attacks using a parrying action with . Upper Slash Knocks a target into the air during a combo with . 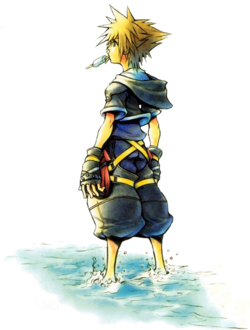 Horizontal Slash During the period of executing an air combo, pressing will allow Sora to do a left-to-right slash. Finishing Leap Unleashes a powerful guard-piercing attack at the end of a combo with . Retaliating Slash When knocked down, quickly regains balance and counterattacks with . Slapshot Sora executes a quick diagonal slash at close range. Dodge Slash Unleashes an attack that deals damage to nearby enemies. Flash Step Unleashes a guard-piercing attack on a slightly distant target while keeping up your own guard. Slide Dash Instantly closes in on and attacks a far target. Vicinity Break Unleashes a powerful attack when surrounded. Guard Break Unleashes a powerful finishing combo move that pierces through a target's guard. Explosion Combo finisher; Sora strikes his Keyblade in a downward position, creating several magical spheres surrounding him while exploding them. Damage is dependent on Sora's magic strength. Aerial Sweep Unleashes a powerful leaping attack on targets in midair. Aerial Dive Unleashes a powerful aerial attack on distant targets. Aerial Spiral Closes in on far targets in midair and unleashes spinning attacks. Aerial Finish Unleashes a powerful finishing combo move to a single target in midair. Counterguard Counterattacks nearby enemies with Attack while performing Guard. Auto Valor Automatically sets the Reaction Command to Valor in a pinch, if Valor Form is usable. Auto Wisdom Automatically sets the Reaction Command to Wisdom in a pinch, if Wisdom Form is usable. Auto Limit Automatically sets the Reaction Command to Limit in a pinch, if Limit Form is usable. Auto Master Automatically sets the Reaction Command to Master in a pinch, if Master Form is usable. Auto Final Automatically sets the Reaction Command to Final in a pinch, if Final Form is usable. Auto Summon When a friend is down, automatically sets the Reaction Command to Summon in the Command Menu containing Summon, if Summon is usable. Trinity Limit A Limit Command that uses teamwork to unleash the powerful Trinity attack. Consumes all of Sora's MP. High Jump Allows Sora to jump higher. Quick Run Allows Sora to execute a quick dash with . Aerial Dodge Allows Sora to execute a dodge in mid-air by pressing . Becomes immune to attacks briefly while doing so. Glide Allows Sora to glide in the air by holding in mid-air. Dodge Roll Allows Sora to execute a quick roll. Scan Inspects the target's current HP. Aerial Recovery Quickly regains balance with when knocked down. Combo Plus Increases maximum combo by 1 when on the ground. Air Combo Plus Adds 1 hit to max air combo. Combo Boost Raises the damage of the finishing move on the ground relative to the number of hits in the combo. Air Combo Boost Raises damage inflicted when executing air combo finishers. Reaction Boost Increases damage dealt using Reaction Commands by 50%. Finishing Plus Unleash successive finishing moves after combos. Negative Combo Reduces one hit from air and ground combos. Berserk Charge While MP is recharging, combos continue forever, until MP is recharged fully. Damage Drive Restores the Drive Gauge every time damage is taken. The amount restored to the Drive Gauge is relative to the damage received. Drive Boost Drive Gauges recovers faster when MP is drained to zero. Form Boost Increases the duration of each Drive Form. Summon Boost Increases the amount of time the Summon will stay. Combination Boost Increase damage inflicted when attacking with Limit attacks. Experience Boost Increases experience gained by 100% when Sora is at half health or less. Leaf Bracer Allows Sora to continue casting Cure even when attacked. Magic Lock-On Automatically locks on to a target when casting Fire, Blizzard, Thunder, or Magnet. Draw Draws in and obtains nearby orbs. Jackpot Raises the amount of HP orbs, MP orbs etc. dropped by slain foes. Lucky Lucky Will bring luck by increasing the drop rate of items. Fire Boost Increases damage done with fire-based attacks by 20%. Blizzard Boost Increases damage done with blizzard-based attacks by 20%. Thunder Boost Increases damage done with thunder-based attacks by 20%. Item Boost Increase the effect done with healing items on the field by 50%. MP Rage Restores MP relative to the amount of damage taken. MP Haste Hasten the recharge speed when the MP gauge hits zero. Defender Defense increases when HP flashes red. Second Chance Retain 1 HP after receiving a critical blow (provided Sora has 2 or more HP left). Once More Ensures 1 HP remains after taking damage from a combo. Combo Master Enables Sora to execute a combo even if he doesn't hit an enemy. No Experience Disables the gaining of experience. Master Form is obtained by talking to The King before the second visit to Space Paranoids. Final Form is made available by reaching the "Memory's Skyscraper" and seeing the cutscene with Roxas. This will unlock the chance for Final Form to appear when changing into any other Drive Form. It is easily obtained by going to the "Fragment Crossing" (the second room of The World that Never Was) and changing into a Drive form. If you change to the form that you chose and not Final Form, then go to the "Alley to between" (the first room of The World that Never Was) and you will have your Drive gauge full. Go back to the "Fragment Crossing" and try again. Also, after you have successfully activated Final Form one time, Final Form will be available under Command: Drive > Final. Donald Fire Allows Donald to cast a fire elemental spell; Cost 10MP. Donald Blizzard Allows Donald to cast a blizzard elemental spell; Cost 10MP. Donald Thunder Allows Donald to cast Thunder elemental spell; Cost 10MP. Donald Cure Allows Donald to cast Cure element at expense of all MP. Fantasia Enables the "Comet" Limit Command. Flare Force Enables the "Duck Flare" Limit Command. Draw Attracts Prize balls towards Donald. Jackpot Chance of receiving prize balls is increased. Lucky Lucky Chance of receiving prize boxes is increased. Fire Boost Increase the potential of fire based capabilities. Blizzard Boost Increase the potential of blizzard based capabilities. Thunder Boost Increase the potential of thunder based capabilities. MP Rage Restores MP for each hit taken from enemies. MP Hastera MP recovers at a very fast rate. Auto Limit Allows Sora and Donald to use appropriate Limit move by pressing Triangle. Hyper Healing When knocked out, Donald recovers at a faster rate and more HP is restored. Auto Healing When Donald is switched for another party member, his HP is automatically recovered. Goofy Tornado Goofy spins himself in a tornado fashion, damaging nearby enemies; cost 10MP. Goofy Bash Goofy tosses his shield at a targeted enemy, damaging and recoiling them; cost 10MP. Goofy Turbo Goofy makes a powerful blow with his shield; cost 10MP. Tornado Fusion Enables the "Whirli-Goof" Limit Command. Teamwork Enables the "Knocksmash" Limit Command. Jackpot Raises chance of receiving more MP, HP, or Drive orbs. Lucky Lucky Raises percentage of obtaining rare items from slain enemies. Item Boost Items used on the field have greater effect. MP Rage MP recovers faster when taking damage. Defender Raises defense when HP hits critical. Second Chance Retain 1 HP after suffering from a critical blow. Once More Keeps Goofy at 1 HP after a combo that would normally kill Goofy. Auto Limit Sora and Goofy can use the appropriate Limit move by pressing Triangle. Auto Change Goofy automatically changes with another party member when at critical HP. Hyper Healing When knocked out, Goofy recovers at a faster rate and more HP is restored. Auto Healing When Goofy is switched for a member, his HP is automatically recovered. This page was last edited on 14 September 2015, at 23:31.